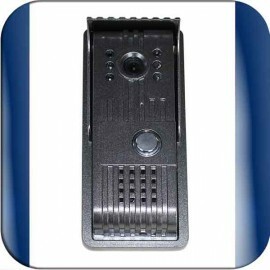 Video Intercom with gate opener comes with night vision lights, 7” LCD monitor and pinhole CCD camera. Whenvisitor press push button of the outdoors station, the bell rings and the colour video image of visitor displays on the screen. Video Intercom with photo and video recording and Gate Open push button, motion detection recording, connect an extra CCTV camera for real time surveillance with picture in picture on the monitor. 8GB memory card for recording and can be taken out to check the files on a computer. Connect to your TV to watch who is at the gate. 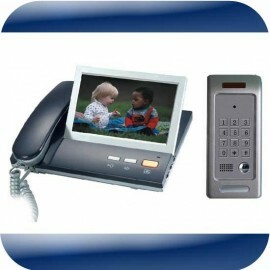 Video Intercom with gate opener come with 7” LCD monitor, pinhole CCD camera, inbuilt keypad with swipe card functions. If the visitor has an ID card or has a Pin no, visitor can open the gate. Goose neck post to mount Keypads or Intercoms. This post is normally stays close to the gate but outside the property. Height of the post can be adjusted. 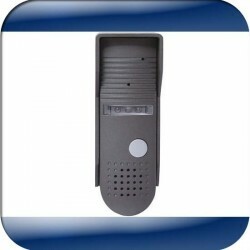 Easy for visitors reaching the Keypad or Intercom from the car. High visibility orange colour post to mount Keypads or Intercoms. This post is normally stays close to the gate but outside the property. This post go into the ground about 0.5M. Pre drilled hole to manage the wiring cables. High visibility orange colour post to mount Keypads or Intercoms. This post is normally stays close to the gate but outside the property. This post fits on a concrete pad with anchor bolts. Pre drilled hole to manage the wiring cables. Goose neck aluminium post to mount Intercoms. This post is normally stays close to the gate inside or outside of the property.